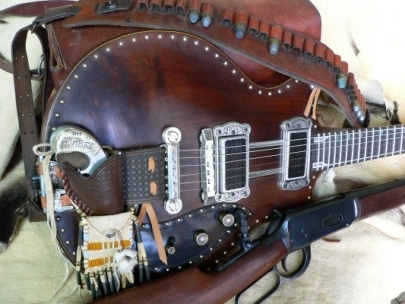 "Hombre" is a limited edition guitar (56 available instruments) celebrating the the multi-cultural heritage of the American "Old West". At this point in time (Feb. 2009) "Hombre" is in the late stages of prototyping and will be available in its final form by March 15. The Tailpiece, Bridge, Pick-up Mounting Rings, Conchos, Strap Plates, Tuning Machines/Knobs and headstock and fingerboard inlays are designed and manufactured at the Goldbug facility in Delavan Wisconsin and are made of solid sterling silver. Each piece has been exquisitely designed and manufactured with unparalleled craftsmanship and attention to detail. 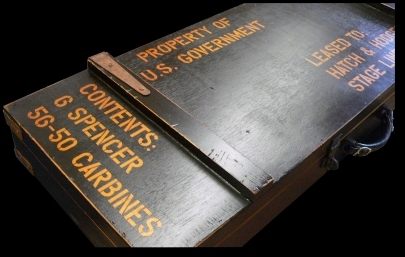 The control knobs are actual Spencer 56-50 brass cartridge casings. 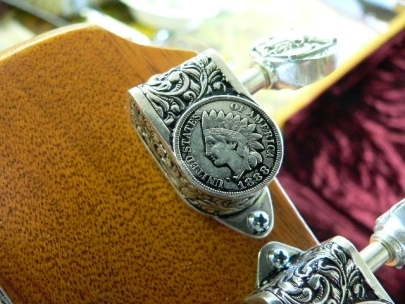 The conchos are sterling silver replicas of 1886 Mexican and US coins and the tuning machine housings prominently display 1886 US Indian Head pennies cast in solid silver. 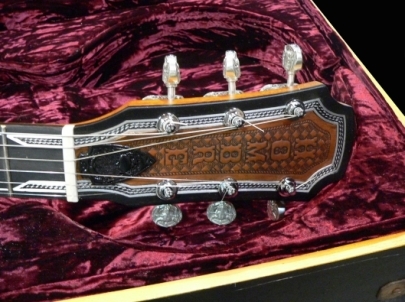 "Hombre" is manufactured with 50's era construction techniques including ‘long tenon' neck joints, 17 degree headstock angle, 4 degree neck set back, and genuine South American mahogany body and neck. "Hombre" has a solid black walnut carved top. 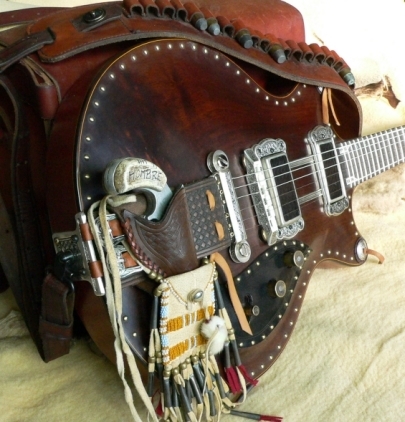 The guitar case is manufactured by Goldbug to simulate an antique firearms shipping crate. The Cartridge Belt Guitar Strap is custom made and is fitted to accept historic Spencer 56-50 cartridges and 45 Long Colt cartridges. It is supplied with antiqued dummy cartridges. The strap attaches to the guitar with rifle sling swivels. The medicine bag is custom made for us by world class Native American bead artist Mary Chee of Colorado Springs. The holster is designed to fit a small derringer, specifically a North American Arms "Companion". This .22 caliber 'black powder' pistol is available from NAA firearms or from any local gun dealer. They also make a .22 LR pistol of identical size. 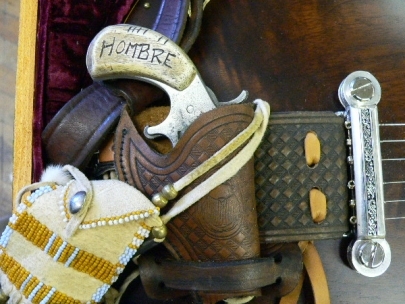 The "Hombre" guitar comes with a non-functional replica derringer with faux bone grips. “Hombre” utilizes a master volume control (closest to neck), a master tone control and a 3-way pickup selector switch. The volume control sets the output level of the guitar regardless of how the selector switch is set. The tone control applies the tone setting to both pickups. The guitar is wired with 50's style circuitry so there is no loss of “highs” when decreasing the volume level. "Hombre" is equipped with Goldbug “Tru-Tap” pickups. This unique passive (non-battery powered) pickup design allows for the switching of humbucker pickups to single coil status with virtually no loss of output power. This unique design avoids the necessity of a very high output humbucker, notoriously mid-rangy and potentially muddy, in order to yield an acceptable output from a single coil. Consequently, "Tru-Tap" pickups have the articulation and clarity of a classic "PAF" style humbucker as well as the full bodied bite of a legitimate full-output single coil pickup. Switching is accomplished by push-pull pots. The volume control pot switches the neck pickup and the tone control pot switches the bridge pickup. 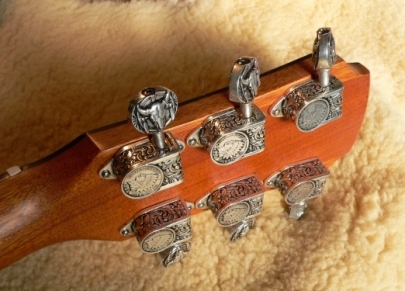 The finish on the guitar is a hand-rubbed varnish simulating an antique rifle stock finish rather than a modern machine or power-buffed guitar finish.